As you will have known, the ongoing winds of change in Ethiopia are transforming the enabling environment for Ethiopians abroad to unleash their talents and resources in support of the development of their motherland. To this end, H.E Prime Minister Abiy Ahmed has made a clarion call to all Ethiopians in the diaspora. In recent months, the Government has announced a number of initiatives aimed at catalysing greater engagement from the Diaspora. To these ends, it has facilitated the creation of a Diaspora Trust Fund and the appointment of a management board to oversee its affairs. Furthermore, the Council of Ministers has approved the establishment of a cross-cutting Diaspora Agency, mandated to engage in all matters relating to the Ethiopian diaspora. 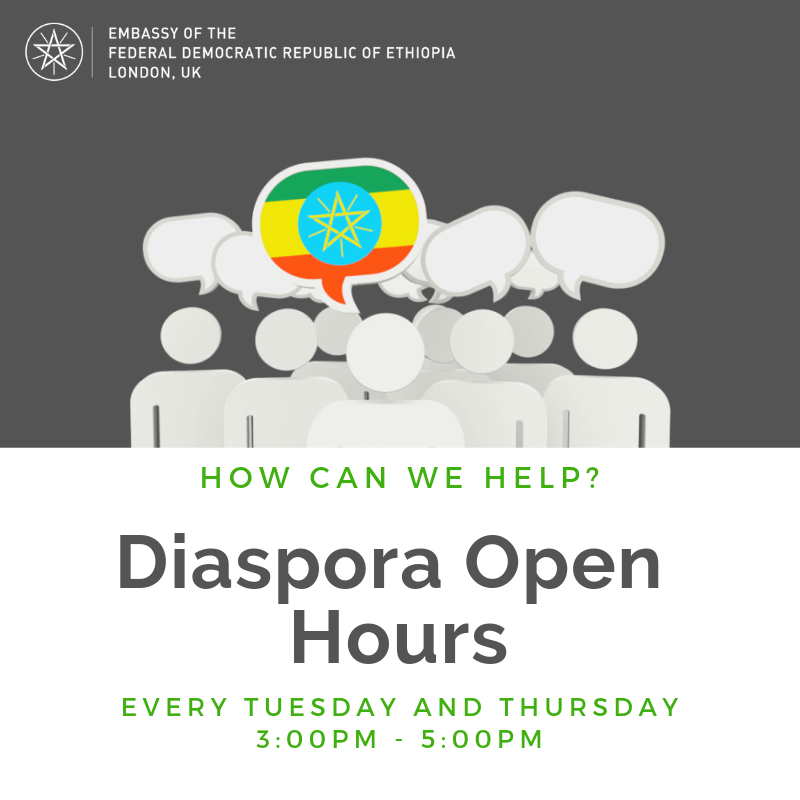 Accordingly, the Embassy of the Federal Democratic Republic of Ethiopia in London avails itself of this opportunity to announce the commencement of dedicated open hours for Ethiopian nationals and foreign nationals of Ethiopian origin residing in the UK. In addition to our regular services on offer from Monday-Friday, the dedicated open hours will serve all diaspora every Tuesday and Thursday from 15.00 – 17.00 (3:00pm – 5:00pm). For further information, please contact the Diaspora Affairs Department at 0207 8383 873 or 0207 8383 886. To allow us to provide essential services and news, especially in emergency cases, please provide your details by completing an online form.